1. Understand your business strategy. 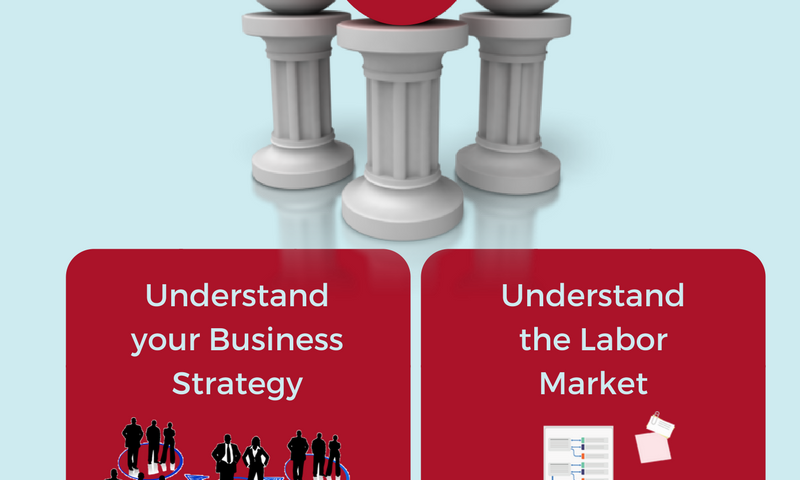 The first step in the strategic workforce planning process is to have a clear understanding of your business strategy. At the end of the day, your workforce is there to implement the strategy and achieve expected business results. Strategic change fails when the people implementing the change don’t know what they need to do differently in order to support the new strategy. These disconnects create confusion, conflict, and stress, and put even the best people in a position to fail. Make sure that you have thought through the operational details of your strategy, and that you have sufficient facts and support to make a good decision. Know how far and how fast you can reasonably move. It takes time, money, and thought to design and build technological infrastructure, production facilities, and distribution capability. Similarly, it takes time to hire, deploy, and train talent. This is even more true when your workforce requires special skills or credentials, or when your jobs are located in a talent-poor or highly competitive region. Basically, you need to know your business strategy, and the impact of that strategy, before you can create a meaningful workforce plan. 2. Understand the labor market. Understanding the labor market for the jobs necessary to drive your strategy will help you better understand the length of time it will take to fill a job, the salary you should expect to pay for the job, and potential challenges to filling the job. For example, a growing suburb might be in need of a new school, but the area is expensive and it is difficult to attract teachers. You need to take these factors into account as you build your strategic workforce plan. Common factors to consider include macroeconomic forecasts, demographic trends, regulatory changes, and talent movement trends within your industry. 3. Understand your future talent demands. Once you have translated your business strategy into operational requirements, you must design the organization and the jobs necessary to implement the strategy. If you contrast this with your organization and jobs as they stand today, you can identify jobs you will need to create, jobs you will need to phase out, and the optimal timing of that transition. Critical roles are those jobs that are mission critical to your future business strategy. If you don’t have a solid plan for filling these roles with capable people, the business strategy simply won’t come to life. Critical employee segments can include mature workers, visible minorities, millennials, ethnic groups, veterans, and others. They can be strategically important to certain organizations that need to fulfill requirements for certain types of government contracts or grants, or that want to meet the needs of key customer groups. 4. Assess your current talent inventory. Once you understand future demand, the amount of change needed, and the optimal timing of that change, you should inventory your current talent pool. This will help you determine how to eventually transition people into new roles. It will also give you insight into who won’t fit into the new organization, and help you create an exit plan. After you have assessed your internal talent inventory and understand the jobs necessary for executing your new strategy, you can identify your gaps, determine a time frame for closing those gaps, and create specific tactics for meeting the future needs of the organization. The last step is to run scenarios in order to understand how the availability of these critical roles or segments impact the rest of your business plan. Then determine how your workforce plan will be impacted. Timing is important, which is why we examined the labor market earlier in the process.